Build and Release Management task to trigger a Azure DevOps release or build pipeline. Trigger Azure DevOps Pipeline is an extension for triggering a Azure DevOps Build or Release Pipeline. Depending on your choice in the task it will trigger a build or a release pipeline. Personal Access Token: The personal access token. 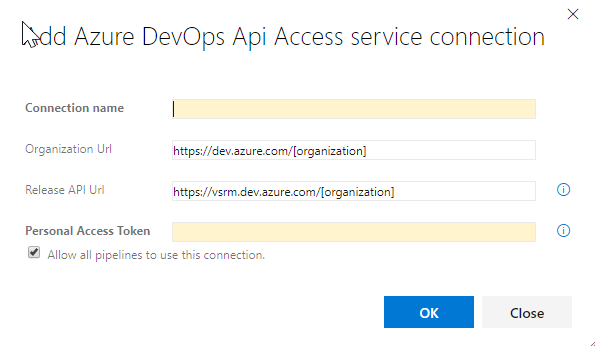 Azure DevOps service connection: The service connection that you have configured. Project: The project where the pipeline resides. Pipeline type: The type of pipeline (build / release). Release Definition: The definition to trigger. Release description: Description for the release. Can also be empty. Build Number: If you want to use a specific build number. It will set the build number for the primary artifact. When left empty it will take the latest build. Build Definition: The build definition to trigger. Branch: The name of the branch to trigger. When left empty it will use the default configured branch. If you like the extension, please leave a review. File an issue when you have suggestions or if you experience problems with the extension.